Snow is a 1998 New York Times Outstanding Book of the Year and a 1999 Caldecott Honor Book. "It's snowing, said boy with dog. 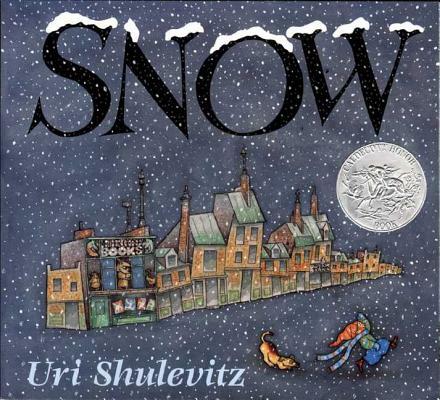 Uri Shulevitz is a Caldecott Medal-winning illustrator and author. He was born in Warsaw, Poland, on February 27, 1935. He began drawing at the age of three and, unlike many children, never stopped. The Warsaw blitz occurred when he was four years old, and the Shulevitz family fled. For eight years they were wanderers, arriving, eventually, in Paris in 1947. There Shulevitz developed an enthusiasm for French comic books, and soon he and a friend started making their own. At thirteen, Shulevitz won first prize in an all-elementary-school drawing competition in Paris's 20th district. In 1949, the family moved to Israel, where Shulevitz worked a variety of jobs: an apprentice at a rubber-stamp shop, a carpenter, and a dog-license clerk at Tel Aviv City Hall. He studied at the Teachers' Institute in Tel Aviv, where he took courses in literature, anatomy, and biology, and also studied at the Art Institute of Tel Aviv. At fifteen, he was the youngest to exhibit in a group drawing show at the Tel Aviv Museum. At 24 he moved to New York City, where he studied painting at Brooklyn Museum Art School and drew illustrations for a publisher of Hebrew books. One day while talking on the telephone, he noticed that his doodles had a fresh and spontaneous look—different from his previous illustrations. This discovery was the beginning of Uri's new approach to his illustrations for The Moon in My Room, his first book, published in 1963. Since then he was written and illustrated many celebrated children’s books. He won the Caldecott Medal for The Fool of the World and the Flying Ship, written by Arthur Ransome. He has also earned three Caldecott Honors, for The Treasure, Snow and How I Learned Geography. His other books include One Monday Morning, Dawn, So Sleepy Story, and many others. He also wrote the instructional guide Writing with Pictures: How to Write and Illustrate Children’s Books. He lives in New York City.